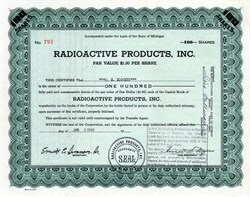 Beautiful certificate from the Radioactive Products, Inc. issued in 1949. This historic document was printed by the Goes Company and has an ornate border around it with a vignette of the company name. This item has the signatures of the Company’s Vice President, James. S. Myers and Secretary, Eran G. Sammson and is over 60 years old. 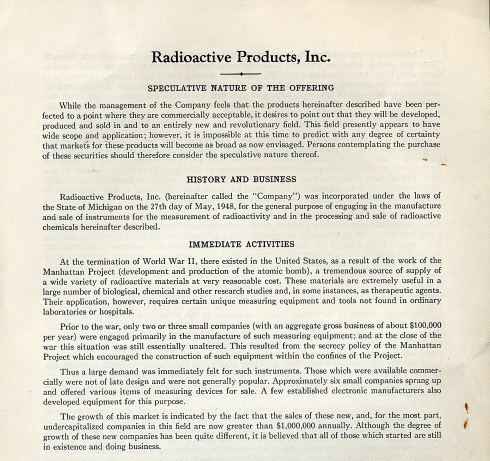 The company was hoping to capitalize on the Atomic Bomb and the work of the Manhattan Project after WWII. One of the products the company made was the Fast Neutron Detector better known as "Rudolph" because its wand had a red tip.